Source: The current layer. The clip to add color changes to. Match: Defaults to None. The clip to copy color changes from. 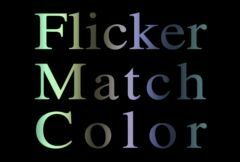 Match Color: Default rgb: [0.5 0.5 0.5]. The average Match color in the rectangle for which the Source input is unchanged. Set Match Color: Push-button . Pressing this button has a side effect of setting the Match Color parameter to the average Match clip color in the rectangle at the current frame. It causes the output to equal the Source at this frame. This button retains no value itself, and is turned back off immediately after being pushed.